A recent story I mentioned in a Live Smart Ohio blog was about one of my first jobs at a restaurant located on Lake Erie where each table got a carafe of ice water with sliced lemons. I was charmed one day by a very young diner who announced that I made the best water ever! This past weekend my household helped “make” the best water ever with produce from Ohio. Full disclosure: not all of the following ingredients came from Ohio during this 4th of July weekend. It’s still too early in our growing season to harvest watermelon, peaches and pears. In order to compare the infused water flavors at the same time, all of those items were purchased from the grocery store. The strawberries and blackberries were from Northwest Ohio but they had been frozen. All of the herb, basil, sage and rosemary were fresh from the backyard garden. All of these foods do grow in Ohio and I will be repeating these recipes when those other fruits are in season later this summer! There is no one way to make infused water. 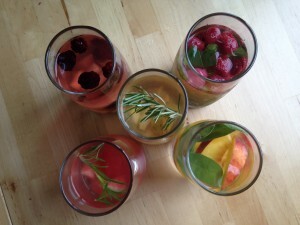 There are infuser pitchers but you can make the infused water in a plain pitcher or a single serving in a glass. For this comparison (and space in our refrigerator) I used glasses. You can strain out the foods before serving or leave some of the whole fruits, vegetables and herbs in the class. The fresh produce in the glass looks very pretty, compared to the frozen and then thawed berries. For drinking purposes, it’s easier to have the produce strained out first. This was a good “recipe” for my toddler since he could help wash the produce in cold, running water and “chop” it with his plastic knife and cutting board. The type and variety of fruit will make a difference in the color and amount of sediment in the infused water. For example, a soft pear was very strong in flavor and had more sediment than a firm peach. The berries were frozen from last year so they were not as beautiful as fresh berries but they added flavor as well as a nice color to the water. Included are two different pictures of our five samples. One photo shows the ingredients in the glasses and the other shows our numbered samples for a taste test. Although we all had different choices in ranking our favorite, they were all good. All of the samples received a thumbs-up. The watermelon waters were very sweet, and the very-ripe pear had a dominate flavor. I really liked the herbs in the infused water but like other produce, some herbs are going to taste much stronger than others so go lightly when experimenting. Knowing that sage leaves could have strong flavor, I only used a couple in the Peach Sage infused water. That one was my favorite! 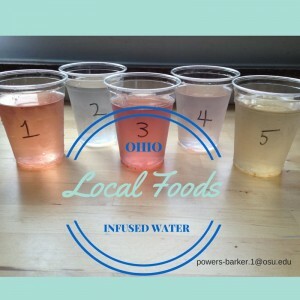 Posted by Patrice Powers-Barker at 1:07pm July 14, 2015 Posted in Family and Consumer Sciences, Local Food and tagged Live Smart Ohio, ohio local foods, think your drink. Bookmark the permalink.